Finding a Japanese restaurant that serves reasonably priced sushi but is also feels authentic makes me happy. The fact that Shinobu is relatively close to my house makes things even better! 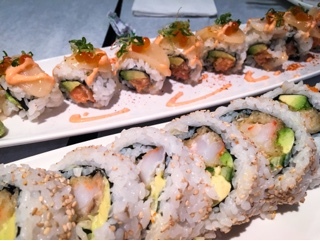 I love introducing people to the place, so when two friends had a hankering for sushi, the small cozy restaurant came to mind. Having had a great experience previously with their maki rolls, they had to be ordered again: you can read all about the double shrimp cannon ($9.80) and volcano rainbow roll ($10.90) in my first dinner post about Shinobu. Another favourite that’ll have me coming back is the hotate dream roll ($10.50), a spicy salmon roll covered with thinly sliced scallop sushi and salmon roe. If sushi rolls could be a pillowy cloud the hotate is close, the scallop soft and creamy then topped with popping salmon roe and micro greens for interest. 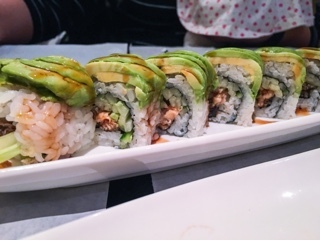 Plenty of avocado was layered over the green dragon ($9.90), the roll filled with BBQ eel and cucumber for an umami filled crunch. 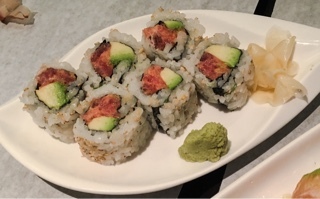 Their spicy tuna ($6.90) is the type I enjoy, where the fish isn’t pulverized instead left in small cubes and tossed with spicy mayonnaise. Yet, you should branch out and try their izakaya eats, which were also impressive. 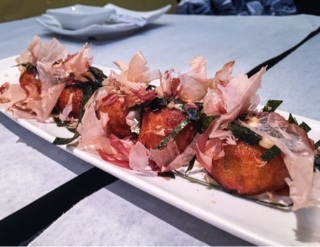 The takoyaki ($6.90) is five soft glutinous mashed potato like balls of dough, fried so there’s a crispy coating and each containing a piece of grilled octopus. It’s one of the better versions in the city. The nasu dengaku ($6.90) was surprisingly delicious despite being a relatively simple dish. 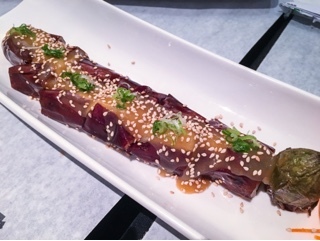 A Japanese eggplant is lightly fried, slit open and filled with a rich sweet dengaku miso sauce; since the longer Asian eggplant is not as seedy, it combines to become a creamy texture. 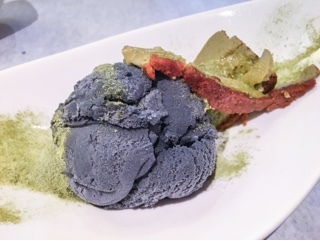 Strangely, the green tea cheesecake ($5.50) is more ice cream than cake - the first thing you see is the large sphere of black sesame ice cream, on the side is the thinnest slice of cake I’ve seen, really just a garnish. The cake itself is pretty good, velvety with a deep matcha flavour, too bad it becomes lost in the ice cream. Oh well, it’s a small miss compared to all the hits at the restaurant. There’s no doubt I’ll be returning and welcome you to try this great find in the neighbourhood.